Almost all of the liquid for this loaf comes from a bottle of Guinness Extra Stout, which gives the bread lots of character and is nicely complemented by the distinct flavour of rye, fennel and citrus. I had it as part of an avocado, tomato and sharp cheddar sandwich, but I hear it would be just as perfect for a Dijon mustard/sauerkraut/corned beef combination. I made some slight tweaks to the metric version of this recipe, such as incorporating sourdough into the sponge, reducing the amount of yeast accordingly, and also added some citrus zest for a extra little twist. No sugar is added to the loaf but there is a mellow sweetness to it, which I suspect comes from the Guinness. All in all, a great loaf and certainly one that I will make again. *Don’t have a sourdough starter? 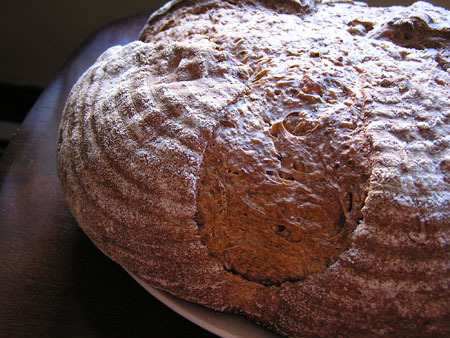 Try Susan of Wild Yeast’s version instead, which uses instant dry yeast. *Can you please tell me what these metric measurements are in cups/spoons? See Mary of One Perfect Bite’s version. Makes one very large loaf. Mix all of the sponge ingredients in a large bowl. Cover and leave at room temperature for about 4 hours; the sponge is ready when it has expanded and bubbles appear on the surface. It will also feel a bit poofy like a marshmallow. Add all of the ingredients for the final dough to the sponge and mix roughly in the bowl, just until there are no bits of unincorporated flour left. Autolyse (let it sit) for 30 minutes at room temperature. Do a set of stretch-and-folds in the bowl, and repeat after another 30 minutes. Turn the dough out onto an unfloured counter, fold, return it to the bowl and let it ferment for another 30 minutes. This means your dough will have fermented for a total of 2 hours, with two stretch-and-fold in the bowl (at 30 min and 60 min) and one stretch and fold on the counter (at 90 min). This dough is going to feel very soft and sticky at first, but will gradually increase in strength with every stretch-and-fold. I guess this is the cheap (mix by hand, no stand mixer involved) and lazy (let time do all the work, no rigorous kneading required) way of working with fairly wet doughs? Turn the dough onto a lightly floured counter, and preshape into a loose ball. Let it rest, covered, for 15 minutes. Bake at 400°F with steam for 12 minutes, and 18 minutes without for a total of 30 minutes or until the crust has turned a caramel brown. This is my submission for Bread Baking Day #33 – Breads with booze. I’m sending this loaf to Adriana for hosting BBD33, the BBD founder Zorra of 1x umrühren bitte, Mary of One Perfect Bite for posting the recipe, and Susan at Wild Yeast for writing about her variation of the same loaf, and for YeastSpotting. 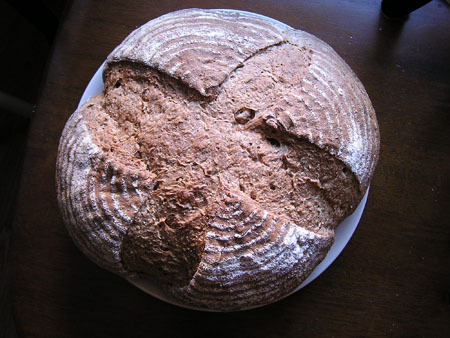 This entry was posted on September 1, 2010 at 11:50 pm and is filed under Bread Baking Day, Sourdough, Yeast bread. You can follow any responses to this entry through the RSS 2.0 feed. You can leave a response, or trackback from your own site.